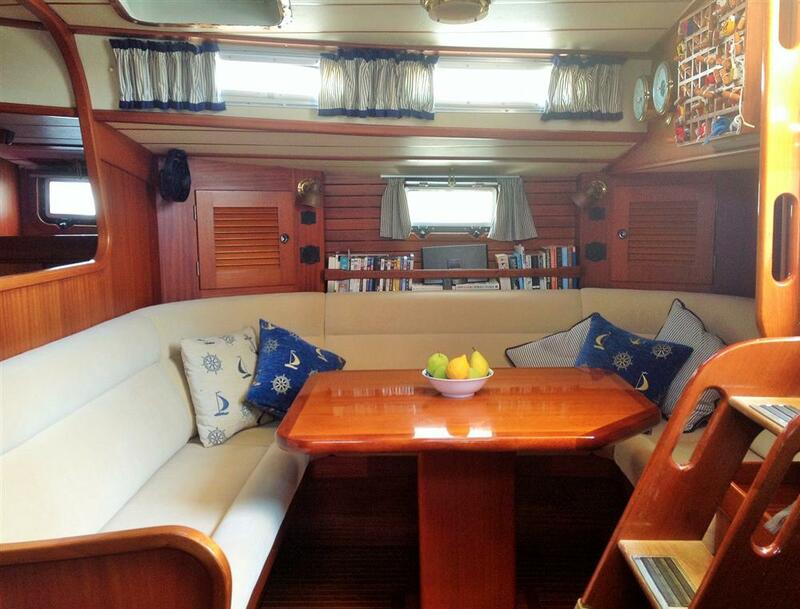 A true blue water classic, a superb boat for worldwide cruising, with ample space for all possible cruising equipment. 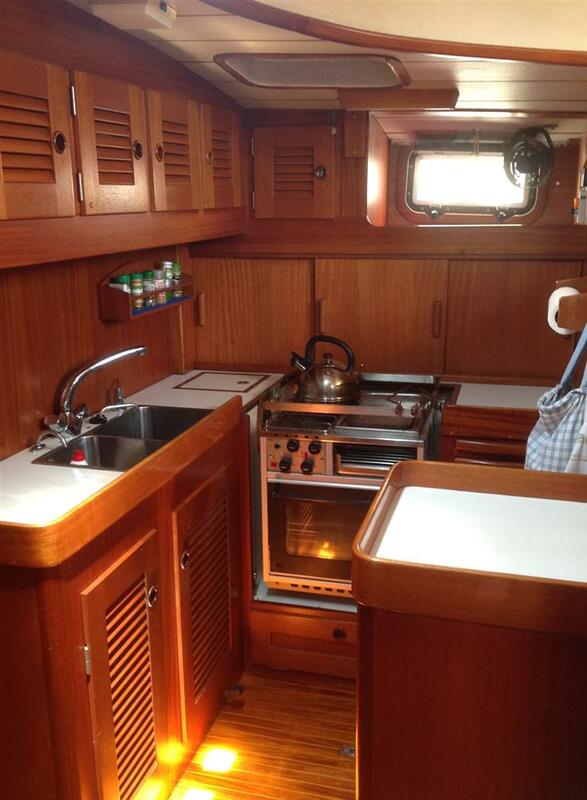 Her clean flush deck is highly appreciated and very practical. This particular sloop rigged example is a unique HR49 having been built for an American owner who wanted to cruise the intercostal waterways in the United States. To accommodate the depth restrictions she has a shallower than normal draft of 2 meters rather than the usual 2.2 draft, which in turn has made Exuma far more capable. Additionally she was also specified with a main cabin roof which is wider, a little higher and has windows which give excellent additional light below. 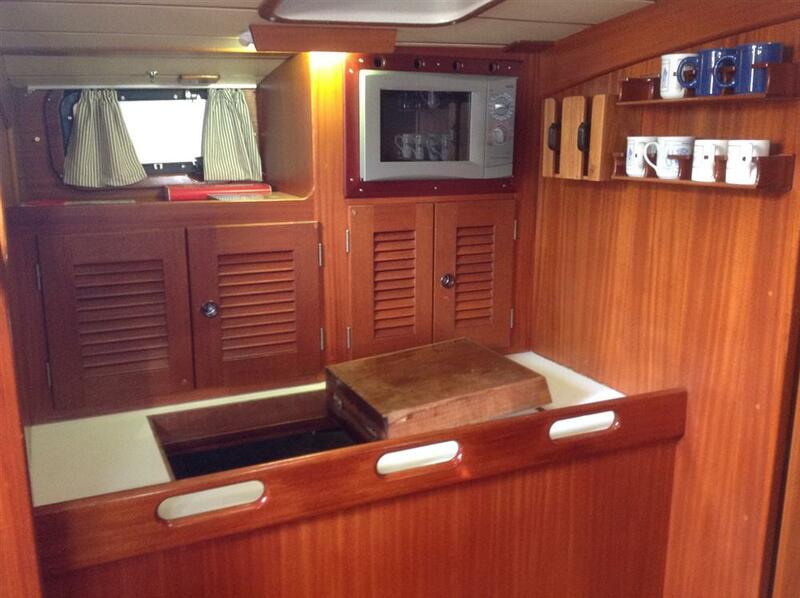 Both of these factory alterations are regarded as substantive improvements on an already very well designed yacht. 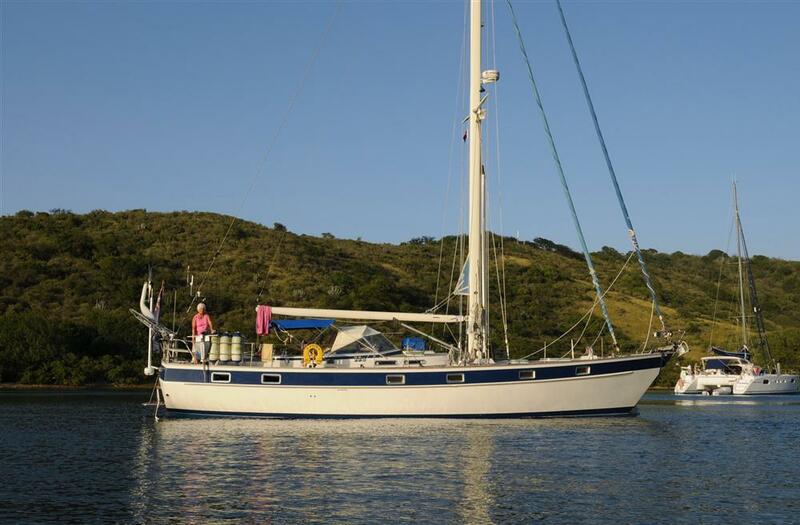 Exuma was bought by her present British owners in 2002 in Barcelona and has since then been hugely re-fitted to a very high standard, including professional replacement deck in 2007 (finished in 12 mm best quality teak together with new toe rails) decks also recaulked and sanded in 2016, her mast and boom were serviced and repainted in 2016, the standing rigging was replaced in 2014, she has had new Raymarine electronics in 2006, recent new interior upholstery in saloon (Alcantara 2013), recent Copper Coat treatment and much, much more. 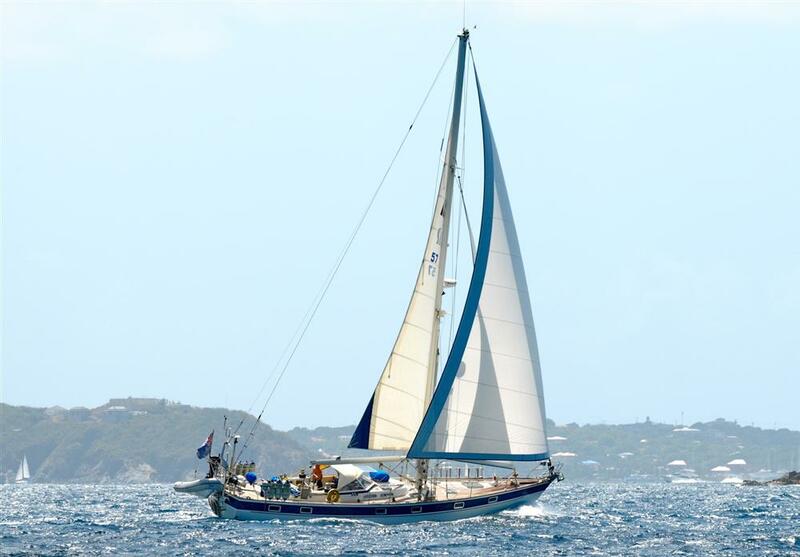 Exuma is a sloop with a mainsail that furls into the mast - push button. The main sail was made by shore sails and has been cut flat with short vertical battens. It holds its shape well and is infinitely reef able without leaving the cockpit. Forward of the mast is a cutter sail. It is for heavy weather, is in good condition, has a Selden self furler and again is reefed from the cockpit. The genoa is large and mounted on a twin track forestay which is push button reefed with the Reckmann Hydraulic Furler. There is a second genoa of similar size which may also be simultaneously rigged to provide efficient downwind sailing. 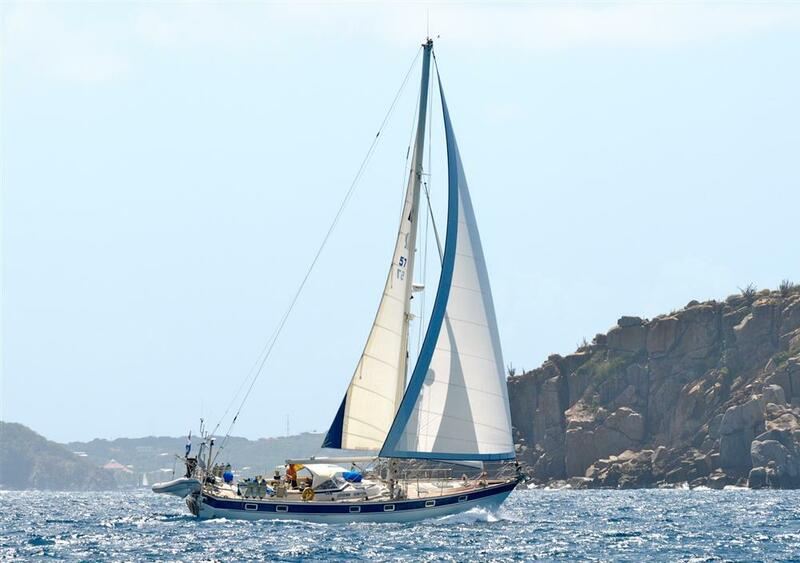 When rigged in this fashion both sails are reefed simultaneously with the Reckmann Furler. 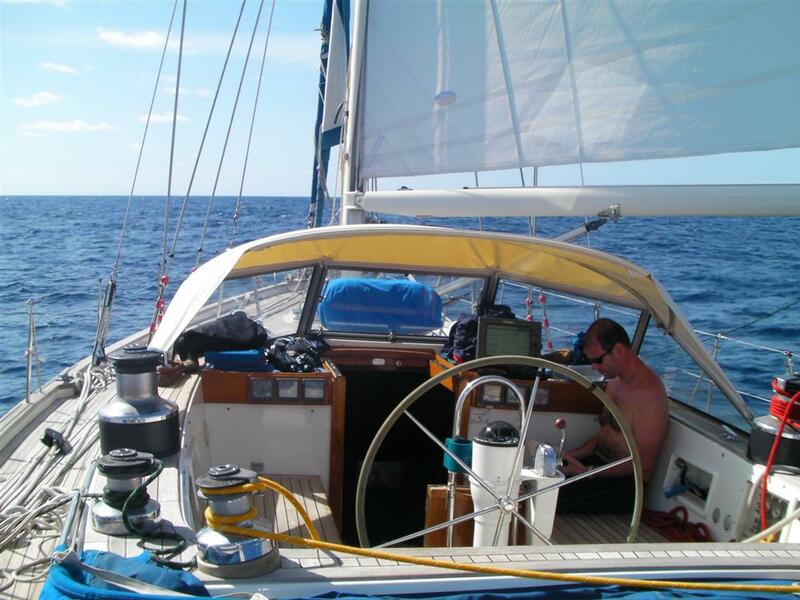 With this rig it is easy and quick to adjust the reefing - again from the cockpit. 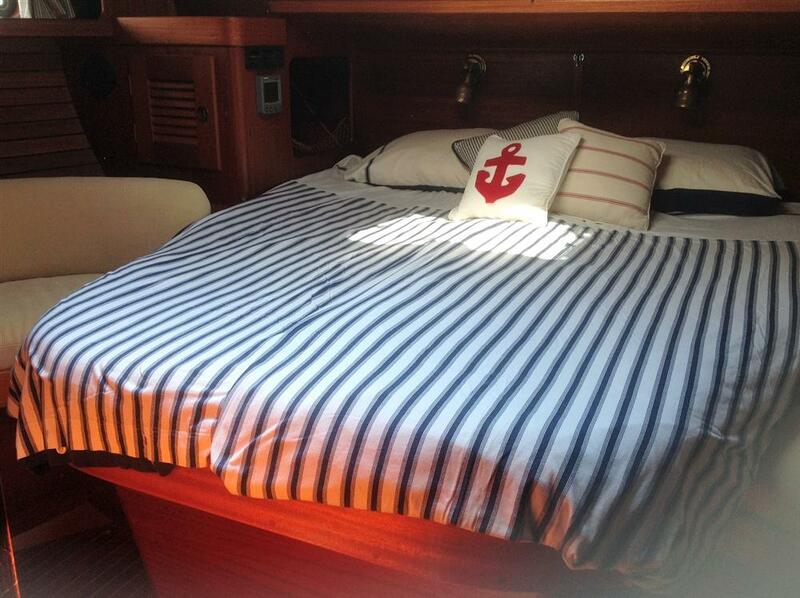 When close hauled the lazy genoa just lies inside the working genoa. There is a cruising chute rigged from the bottom of the forestay. It is an excellent sail for light to moderate winds just forward of the beam. The sail is snuffed by a haul down bag - good for transatlantic crossings. Teak deck redecked (2007) in 12 mm best quality teak together with toe rails. Main cleats, fore and aft, also replaced. Bimini on stainless steel mounts, collapses easily and has zip cover to tidy up when not in use. At the bow is a Manson anchor with 85 meters of 10 mm stainless steel chain, lifted by an anchor winch (2007) with controls on the deck and remotely in the cockpit. There is also a further fortress F37 anchor with 10 meters of chain and adequate rope. A rope spool with 100 meters, 12 mm rope for tying back to the shore. At the stern is an electric winch for taking the strain out of lifting a stern anchor or bringing the stern in against a strong cross wind or current. 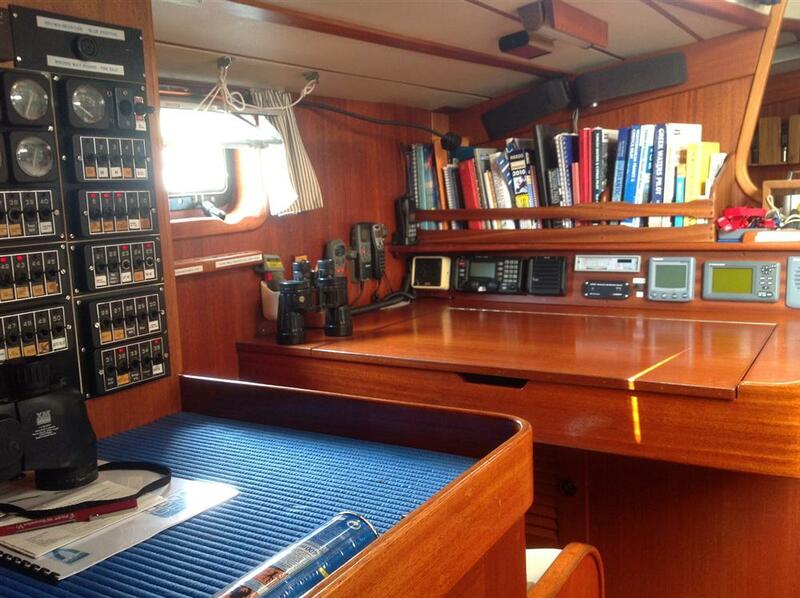 Autohelm control unit (raymarine plus robertson hydraulic rams) plus a wireless, hand held, control unit. Shore power via 220/240 volts or 110 volts shore, so suitable for American supply. 6 x 115 amp hour (June 2016) - split into all together, or 2 and 4. 2 x 12 volt batteries - one dedicated engine start. One 12 volt services. Bilge pumps - multiple with alarms and auto start. 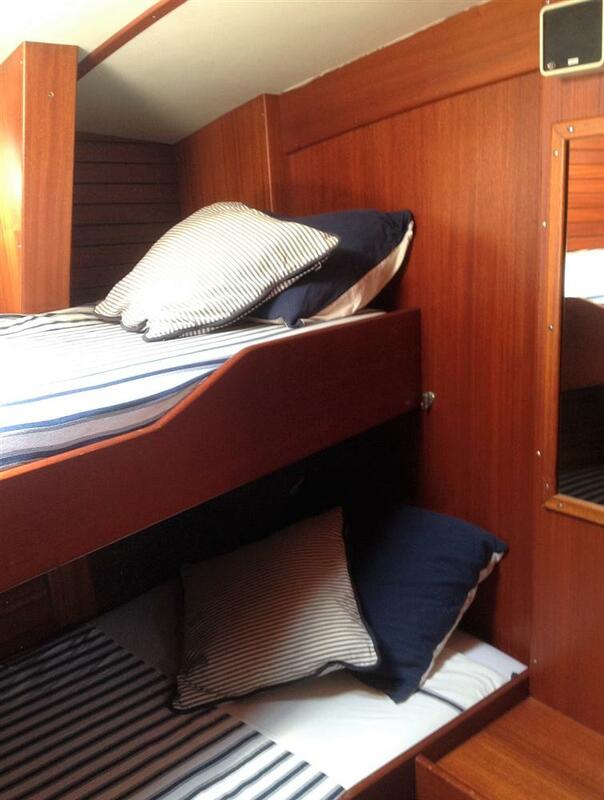 “My wife and I chose the Hallberg Rassy 49 “Exuma” because she has a wide flat deck, a large cockpit, and as she is sloop rigged, an uncluttered aft deck. Coupled with that, she is immensely strong and will handle any sea. We spent three years researching the market until we found Exuma. Her original owner specified her with top level options. The main winches (Lewmar 65) and the forsail and main furling (in mast) are electro hydraulic rather than just electric and the mast is the best - Reckmann. 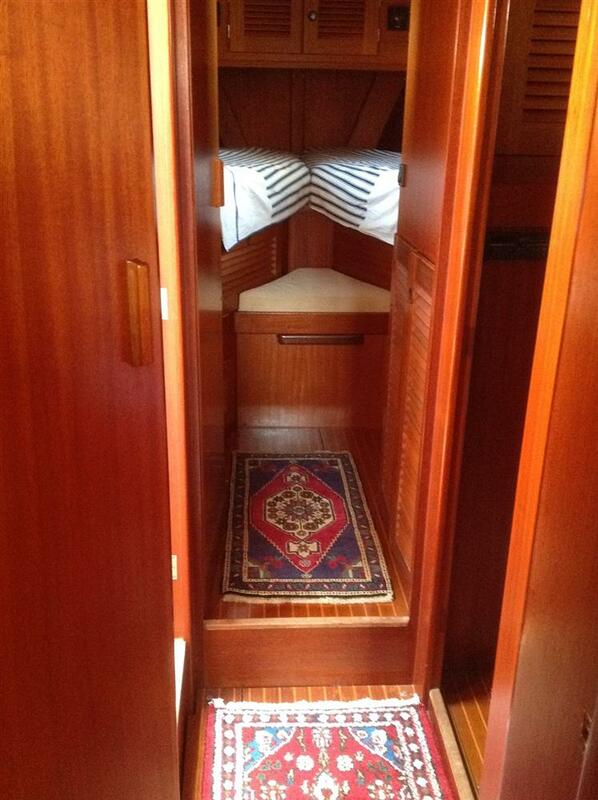 This expense no object approach is seen throughout the yacht and we have been absolutely delighted with her.